I have never made pizza before in my life, but I love eating pizza. I remember in college when I traveled to Europe on a study tour and we had authentic Italian pizza I was in food heaven. There are so many forms of pizza, if you are from the Midwest and frequent Chicago, you will probably think that deep dish pizza is the best. If you reside in New York, you will think New York style pizza is the best. There is Californian style, the famous D.C Jumbo slice, St-Louis style, Neapolitan style, Detroit style pizza and the list goes on. At the end of the day pizza is one of those foods that everyone loves and enjoy. As I was pondering on what kind of pizza I was going to make, the most intimidating part of the process was the dough. If the dough was not right then the whole pizza would not be good. I was feeling a bit overwhelmed but after watching some YouTube videos I realized that it actually was not as difficult as I thought it would be. The first thing I did before buying ingredients was figuring it out what kind of flour to use for the dough. I decided to use bread flour. I recommend this because not only is it cheap and easily accessible at your local grocery store, it also has a higher gluten content than all purpose flour. I prefer using King Arthur’s Bread Flour. You can use all purpose flour if you’d like but when it is time to stretch the dough it can tear easily. I know I’ve said in the past that you do not want too much gluten, however, for pizza dough, you want it to be crispy on the outside and chewy and soft on the inside. To achieve this, your dough has to have a higher gluten content. Another thing that is important is your oven heat. Set your oven to 500 degrees if it goes that high, if not, have it on the highest heat possible. I bought two pizza stones to bake my pizzas. Make sure to dust the stone with semolina flour or cornmeal if semolina is not available. This prevents the dough from sticking to the stone and helps create the crispy texture you desire. I recommend using pizza stones but you can also use a baking sheet with parchment paper. Alright, lets talk sauces! I made a simple no cook tomato sauce and a pesto sauce as well. I experimented with the tomato sauce until I got the flavor that I wanted. The first sauce I made I put way too much garlic and I did not strain my tomatoes properly so it was too watery and too garlicky. So on my second attempt, I did a combination of diced tomatoes and tomato paste. I will insert the recipe below for the tomato sauce as well as the pesto sauce. For your toppings keep it simple, you can precook your toppings depending on what vegetable it is. For fresh herbs like basil or parsley add them after the pizza has cooked so you can maximize the flavor. For cheese, I used fresh mozzarella that I got from my local supermarket. You can use any kind of cheese you desire. For my vegan friends, Chao Cheese or Daiya cheese works perfectly on these pizzas, although Chao cheese melts better. 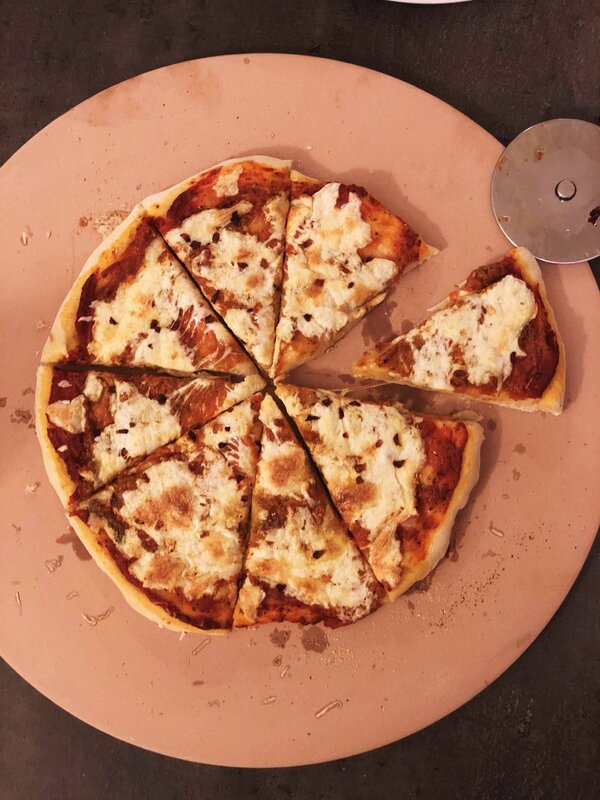 I hope you guys have as much fun making these pizzas as I did. Get creative with your toppings and be sure to inbox me and tag #sweetemms in your creations! I’d love to see them and as always, bon appétit mes amies! Pour 3/4 cup of warm water into a bowl and pour packet of yeast and let it sit until yeast is dissolved. Takes about 5 minutes. In big bowl, brush the sides of the bowl lightly with olive oil. Mix together flour, sugar and salt together. Create a well in the middle of the bowl and add in 2 tbsp of olive oil and pour in the water and yeast mixture. Mix with hands or put in a food processor until the dough forms a sticky ball. Transfer unto a floured surface and knead dough until smooth. The dough should spring back when you poke it. If it is still sticky add 1 tbsp or flour and knead together til smooth This should take about 6-7 mins. Bake for 8-10 mins or until cheese is melted and the crust is golden brown. Cool and enjoy! Place all the ingredients in a food processor or blender. Puree until mixture forms a thick paste. Add to pizza dough with desired toppings. Mushrooms and sun dried tomatoes are good toppings for pesto. In a bowl or food processor mix all the ingredients together until sauce is thick. If it is too thick, add 1 tbsp of water at a time until desired thickness is achieved.